This edition of GetWet Philippines News offers a review of the Easter Regatta in Puerto Galera including an experiment with some mobile technology that will allow everyone to follow yacht racing from anywhere in the World via the Internet. Plus, we have some news for anyone interested in the rowing or paddling in the Philippines. But the first item is all about how you can build your own boat and learn to sail it, all in one weekend. For a decade now the Philippine Home Boatbuilders Yacht Club (PHBYC) have been promoting the knowledge that almost everyone can afford to build their own boat. For less than the cost of a new iPhone, you and your family can enjoy the sport of sailing anywhere where there is enough water for the boat to float. 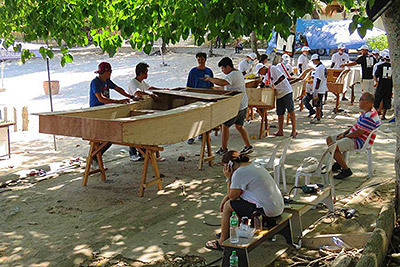 Previously, the PHBYC has held Family Boatbuilding Weekends in Taal Lake (Batangas) and on Mactan Island (Cebu). In 2017 the Family Boatbuilding Weekend will be on Samal Island (the Island Garden City Of Samal of Davao del Norte), from 10-12 June – the Philippine Independence Day holiday weekend. Ten boatbuilding opportunities are on offer for any family or group who want to get their feet wet in the sport of sailing for the lowest possible investment. By the end of the Family Boatbuilding Weekend on Samal Island a fleet of ten sailing boats will have been launched, each boat capable of taking three to five people for a fun day on the water. The boat was designed by the Australian designer, Michael Storey, specifically for the Philippines, and specifically to encourage more sailing groups to blossom around the country. The Oz Goose, at it is affectionately known, has been proven to be a most stable and safe small boat design that can sail faster than almost all other boats of its size. The Oz Goose is now a recognized racing class on Taal Lake and has featured prominently in recent Round The Volcano weekend regattas at the Taal lake Yacht Club. If you are interested to build a boat and learn to sail it all in one weekend on Samal Island during the Philippine Independence Day weekend then contact MarB Concepts Event Organizers for details. Puerto Galera was host to a record 21 sailing yachts and catamarans that arrived from as far away as Hong Kong for the 26th PGYC Easter Regatta. The Easter Regatta was the most fun to be had on the water at Easter in the Philippines. As an experiment this year, one of the yachts was carrying a GPS tracker so that its progress around the race course could be tracked and displayed on the Internet. 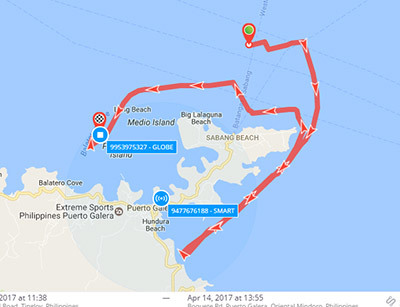 The purpose of the experiment was to determine if the use of the GPS tracking devices would offer a practical way for engaging a global Internet audience for the largest yachting event in the Philippines – the All Souls Regatta, 3-5 November, 2017. The GPS tracker units were provided by Manila GPS Trackers and were tested along two of the courses sailed. Manila GPS Trackers mostly supplies their tracking units to vehicle fleet operators around the Philippines but they see that the rapidly growing sailing and water sports community also need to keep track of boats and people while on the water. During the experiment the tracking unit used was receiving signals from terrestrial cellular phone networks: Globe and Smart. This option was the first choice because the unit is powered by an internal, rechargeable battery and requires no recharge over a number of days of operation. By contrast, the farther reaching tracking units, that use satellite signals, would have required a permanent connection to a 12VDC source (as one would normally find in a car or truck for example); some of the competing yachts do not have 12VDC batteries. The result was that the progress of the yacht was plotted throughout the courses set across the Verde Island Passage for real-time tracking via the Internet. As a by-product, the data collected was used to create a “video” of the yachts progress. In the experiment, only the mobile phone number was displayed but this will be replaced by each yacht’s name so that Internet users can follow the progress of their favorite yacht(s). The video can be used later by the yacht skipper to work out how his yacht performed relative to others and to see where tactical gains could have been made for better performance next time. If adopted by the Puerto Galera Yacht Club for the All Souls Regatta 2017 then we will be publishing details of how to access the online tracking right here on GetWet Philippines News . . . stay tuned. From a chance meeting with a white water rafting outfit in Davao City, two weeks later we found ourselves watching the Philippine Olympic Rowing Team practicing on the La Mesa Dam in Quezon City, Metro Manila. 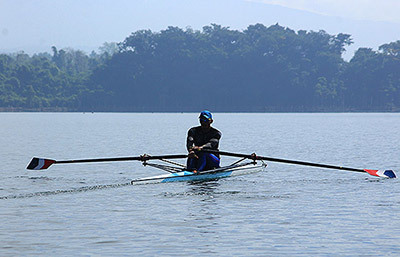 The Philippine Rowing Association (“PRA”), under the Philippine Sports Commission, represents the core of the Philippine Olympic Rowing Team. The PRA’s objective during 2017 and beyond is to reach out to the Provinces to find new competitive blood by promoting the sport of rowing to the Nation’s youth, and to any more-mature rowers with enthusiasm and appropriate experience. The PRA is actively seeking flat-water locations around the country where the slim, shallow rowing boats (“racing shells”) can be used effectively over straight-line distances of 1000-2000 metres. The first two locations identified, and now being developed, are located on Lanao Lake, Marawi, and among the vast mangrove areas of Del Carmen, Siargao. There is also the possibility of a facility being developed along the shores of Samal Island. What does it take to be a competitive rower? Although rowers may come in any size, for maximum potential performance women rowers are 5’7″ and taller, while rowing men should be 6′ and taller. As PRA President, Quintin Pastrana, pointed out, leg length and arm reach are the keys to applying maximum force to the oars for maximum speed. If you live close to an area of usually flat-water and are interested in develop a local competitive rowing team then you should contact the PRA for more information. Rowing, like sailing, is a sport where the physique of the Filipino is perfect for winning gold on the international stage. Dragon boat racing is yet another sport where the Philippines regularly wins gold in international events (and has established a few World Records). Dragon boat racing has grown as a popular sport in the Philippines and is now available in places as diverse as Manila, Boracay and Davao. The “Bugsay Mindanao” series of dragon Boat racing events has been pioneered by Bugsay Pilipinas and brings together enthusiasts from all around the country to visit new destinations, and to engage more supporters. 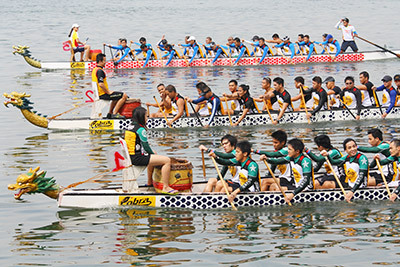 The organizers behind the Bugsay Mindanao events aim to expand the popularity of the sport by taking the dragon boats to the people all around Mindanao. The next Bugsay Mindanao Paddle4Peace will be held in Surigao City from 20-21 May, 2017, along the wharf fronting the Hotel Tavern. If you want to get into the sport of paddling then this would be a good place start.